The summer edition of CQ Life Magazine has been included in the July/August edition of The IN Derby magazine this year. 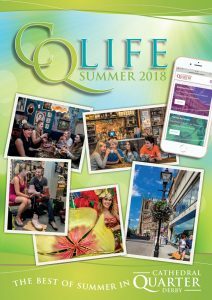 CQ Summer Life magazine consists of twenty pages and is packed full of interesting features, business information,entertainment, gift ideas and more. 20,000 copies of the IN Derby magazine have been printed and are available to pick up at locations around the city including Derby Bus Station, INTU Derby, Quad, Make Your Escape, Derby Theatre, Starbucks, Derby University Kedleston campus and 7 Derby University Halls of Residence. Plus, over 25 other stockists including bars, restaurants, cafes and public buildings. You can also view the magazine online – Click here to view.